to develop locally-driven approaches to responsible development, and to help prepare for climate-related changes on Oregon's south coast. The Partnership for Coastal Watersheds (PCW) is led by the Steering Committee, a diverse group of community members and citizen scientists with associations to cultural interests, economic development, natural resource protection, government agencies, and business interests in the local Coos Bay area. 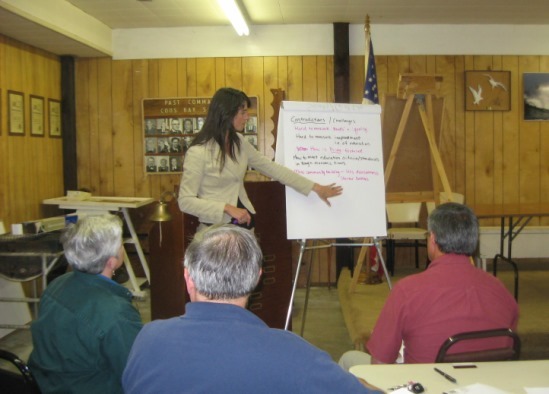 Its members carry out projects using collaborative processes. 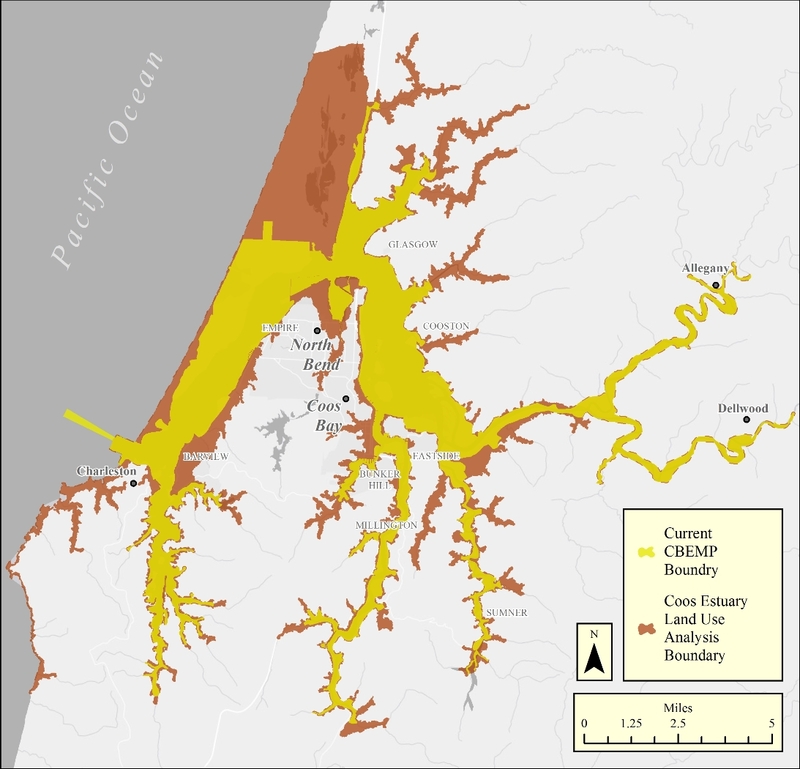 Project area boundary, which includes CBEMP boundary and highest tsunami inundation flood zone. Modern management of the estuary and surrounding shorelands is based on the economic and social drivers of the 1970's era within which local land use plans were developed. The Coos Estuary Land Use Analysis project will assist the County's Planning Department to collect and analyze up-to-date information (e.g. 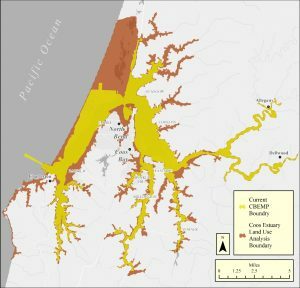 current land ownership, risk factors such as landslides and tsunami inundation, etc) that is critical to the county's future revision of the Coos Bay Estuary Management Plan. It will then help Coos County evaluate options from three perspectives: economic development, natural resource protection and restoration, and socio-cultural interests. 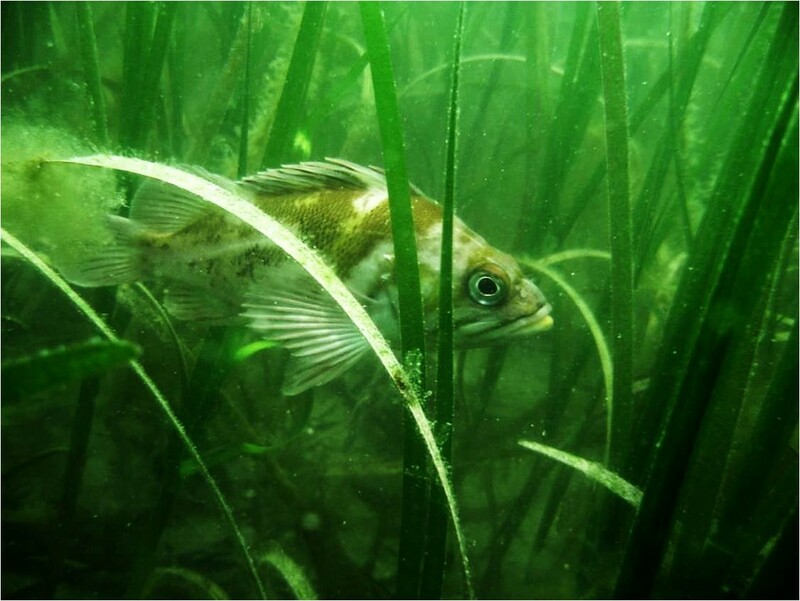 Photo: S. Jeffery - Copper rockfish swims among eelgrass blades. The Communities, Lands & Waterways Data Source (Data Source) is an encyclopedic compilation of all available data describing the socioeconomic and environmental conditions in the Coos estuary and lower Coos watershed. The Data Source provides in-depth status and trends information about the project area's environmental attributes (e.g. water quality, oysters, eelgrass, etc.) and evaluates our community's social and economic attributes (e.g., demographics, shools, etc.). Several other projects help us understand conditions in the watershed. The State of the South Slough and Coastal Frontal Watersheds is a status and trends assessment of those named regions. 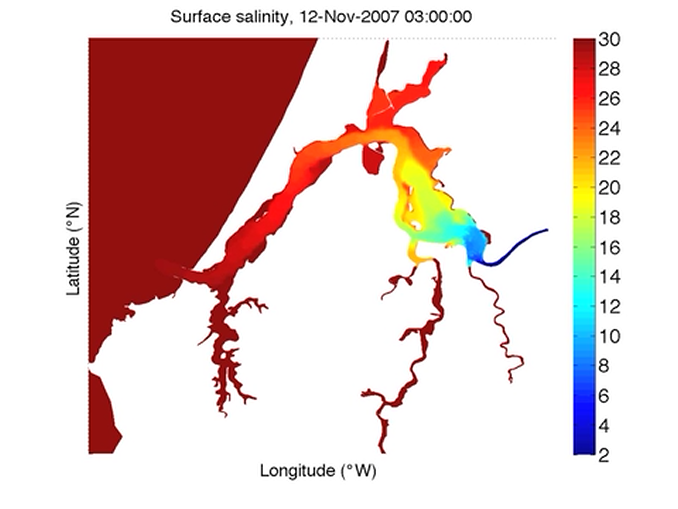 The Coos Estuary Hydrodynamic Model is a three-dimensional circulation simulation of water movement throughout the estuary. The Coos Bay Water Quality Monitoring Network captures water quality conditions throughout the entire Coos estuary.